2)THEN BOOT LOADER IT WILL TAKE THE CONTROL OF THE SYSTEM FROM THE FOLLOWING FILE /ETC/LILO.CONF /ETC/GRUB.CONF (LILO IS MOST LINUX DISTRIBUTION DEFAULT BOOT LOADER) [LINUX IT WILL LOAD THE IMAGE WINDOWS IT WILL LOAD THE DOS]. 3)IT WILL SHOW THE LIST OF OPERATING SYSTEM WHICH ONE NEED TO BOOT. IT WILL IDENTIFY WHICH KERNEL NEEDS TO BOOT. 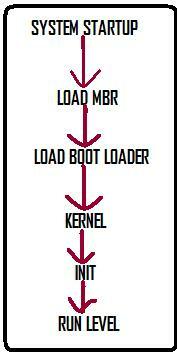 LINUX LOADS THE KERNEL & INITIAL RAM DISK IMAGE INTO SYSTEM MEMORY TO BOOT THE SYSTEM . 4)THEN KERNEL RUN INIT (INITIALIZATION) PROGRAM ACCORDING TO THE /ETC/INITTAB.